The dramatic art-like tub is the focal point of this luxurious modern bathroom. In San Diego, it’s pretty common to find Mediterranean types of interior design styles since they pair so well with our Spanish and coastal homes. But even if your taste leans a little toward contemporary or modern, you can easily mix that theme into your existing décor. A lot of people shy away from contemporary because they think it’s all about cold steel, hard plastic, and stark white. While that palette can be appropriate in the right home, you can incorporate some contemporary touches without losing your home’s warmth. For example, I recently remodeled a fireplace in a Scripps Ranch tract home using contemporary aesthetics. We removed the 16-inch travertine surround and replaced it with 12×24 dark brown tiles that almost give the surround a wood effect. Laid in a brick pattern, they convey an angular, modern look. For another traditional-style home’s fireplace, we removed the cast-stone hearth and natural surround and installed rectangular tile from floor to ceiling. Another way to tweak your home toward contemporary is through furniture choices. Perhaps just one large piece of furniture – such as a modern coffee table in an interesting shape – would give your family room just the touch you want. I really like Room and Board for this because much of their product is contemporary yet they use warmer colors and woods rather than chrome and glass. West Elm is another source for design-friendly contemporary furniture, although it is a bit more basic in design. 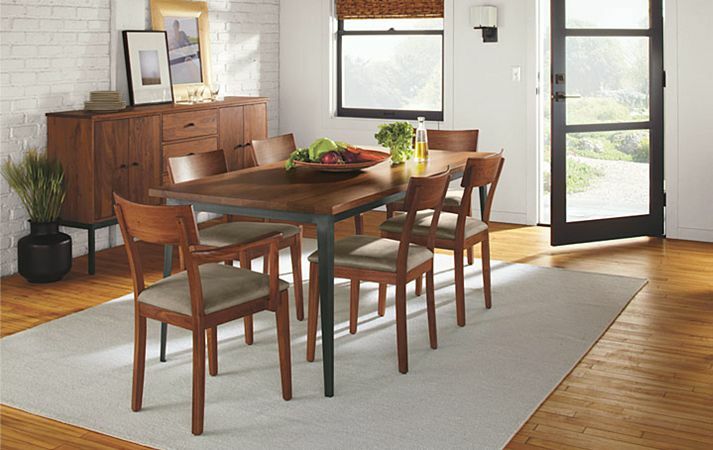 You can achieve a warm yet modern look with furniture such as this dining set from Room and Board. If you love contemporary but can’t seem to make it work in your main rooms, consider doing a modern bathroom as in the photo above. For that remodel we removed the built-in tub and replaced it with that amazing work-of-art tub in the corner. The shower features contrasting cream and dark brown tile. And true to our name, to save the client money we retained the existing vanities but refaced them and stained them in a dark espresso. Our private store, The Style Marketplace, is a great resource for contemporary pieces, as is the website All Modern. Please let us know if we can help add a contemporary look to your home, or assist with any of your design needs. And Happy New Year!